There has long been an interest in food among psychologists across the full range of the discipline, from the physiology of hunger and the psychophysics of taste and smell to the development of food preferences and the social psychology of food-related behaviour and attitudes. 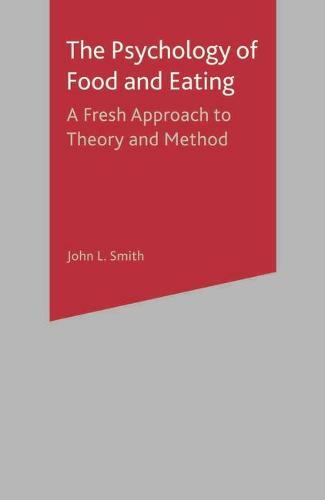 In this new text, John L. Smith takes a much-needed broad view of the field, bringing together physiological research, psychodynamic theory, and sociological perspectives in a way that both celebrates their differences and explores their potential fusion. The Psychology of Food and Eating provides more than a 'dry' decontextualised physiological explanation of food and eating. It moves on to enable students to see food in its wider context in terms of everyday life and real routines. It provides an overview of social scientific approaches to the study of food (biosocial, socioanthropological, structural, feminist/psychodynamic) and an appreciation of the various ways that social psychological perspectives can be applied to real-life contexts. With its detailed (and almost confessional) account of the research process, students will gain an insider's perspective on how observational and idiographic techniques are deployed in practice in everyday settings. The book will prove of interest not only to students and researchers on health psychology, applied psychology and critical psychology courses, but also to all those looking for a really accessible introduction to contemporary alternatives to the more conventional research techniques used in this field.